"Goubiaksang graduated from Angels' Place in 2017 after completing class twelve at Rayburn College High School. He enrolled at Churachandpur College last fall and is studying material science and hopes eventually to go to medical school. Churachandpur College is free to residents of the city, but he must work hard to afford his dream of becoming a medical professional. Though he lives with his mother, she is unable to support him, so he works on a farm caring for pigs to help cover costs of his education. Biaksang had a wonderful time at Angels' Place. In his own words: 'my experience at Angels' Place was awesome.' He went on to talk about all the things he learned while there. He learned how to study the Bible and discovered a new passion and talent; painting. When first given brushes and paints, he immediately became inspired to paint beautiful murals on the walls of the boy's dormitory. He eventually went on to paint portraits and scenes that he gave as gifts to his friends and to faculty at Angels' Place. He still paints and still studies diligently. He is a true Angels' Place success story." 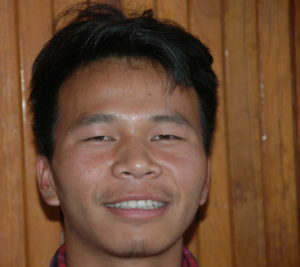 When you meet Bianksang, it is hard to believe he was so lost and broken just 10 years ago. During this season of thanks and giving, we here at the James Connection feel such warmth and gratitude for our donors and sponsors who help us give kids like Bianksang a real chance in life. He, like many others, has become a productive and caring member of society because of all you do. THANK YOU! If you want to learn more about the children at Angels' Place and how you can help make room for more, visit our Ways to Help page. To read more stories about the kids, click on "Angle of the Week" under Categories to the right.